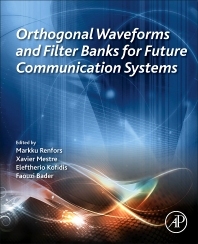 Orthogonal Waveforms and Filter Banks for Future Communication Systems provides an up-to-date account of orthogonal filter bank-based multicarrier (FBMC) systems and their applications in modern and future communications, highlighting the crucial role that advanced multicarrier waveforms play. It is an up-to-date overview of the theory, algorithms, design and applications of FBMC systems at both the link- and system levels that demonstrates the various gains offered by FBMC over existing transmission schemes via both simulation and test bed experiments. Readers will learn the requirements and challenges of advanced waveform design for future communication systems, existing FBMC approaches, application areas, and their implementation. In addition, the state-of-the-art in PHY- and MAC-layer solutions based on FBMC techniques, including theoretical, algorithmic and implementation aspects are explored. Markku Renfors received M.Sc. and Dr. Tech. degrees from Tampere University of Technology (TUT), Tampere, Finland, in 1978 and 1982, respectively. After research and teaching positions at TUT, he was a Design Manager with Nokia Research Center and Nokia Consumer Electronics from 1988 to 1991. Since 1992, he has been a Professor with the Department of Electronics and Communications Engineering, TUT, where he was Department Head from 1992 to 2010. Dr. Renfors is a Fellow of IEEE and recipient of the 1987 IEEE Circuits and Systems Society’s Guillemin-Cauer Award (together with Tapio Saramäki). He has authored 80 papers in refereed journals, about 330 papers in conferences with review practice, and two patents. Dr. Renfors was an Associate Editor of IEEE Signal Processing Letters in 2006-2010. Currently he is a Senior Area Editor of IEEE Transactions on Signal Processing and a member of the Editorial Board of EURASIP Signal Processing journal. He has served in the conference organization committees of ISCAS 1988, EUSIPCO 2000, ICC 2001, PIMRC 2006, SPAWC 2007, and SiPS 2009. He has supervised 18 doctoral dissertations. His research interests include multirate filtering and filter banks, especially with applications in advanced multicarrier and single-carrier waveforms, software defined radio, and algorithms for flexible communications receivers and transmitters. He has actively participated in the EU FP7 projects PHYDYAS and EMPhAtiC developing FBMC techniques especially for cognitive radio and heterogeneous fragmented spectrum use scenarios. Xavier Mestre received the MSc and PhD in Electrical Engineering from the Technical University of Catalonia (UPC) in 1997 and 2002, respectively, and the Licentiate Degree in Mathematics in 2011. During the pursuit of his PhD, he was recipient of a 1998-2001 PhD scholarship (granted by the Catalan Government) and was awarded the 2002 Rosina Ribalta second prize for the best doctoral thesis project within areas of Information Technologies and Communications by the Epson Iberica foundation. From January 1998 to December 2002, he was with UPC’s Communications Signal Processing Group, where he worked as a Research Assistant and participated actively in several European-funded projects. In January 2003 he joined the Telecommunications Technological Center of Catalonia (CTTC), where he currently holds a position as a Senior Research Associate and head of the Advanced Signal and Information Processing Department. During this time, he has actively participated in multiple European projects (including the coordination of the EMPhAtiC project, in 2012-15) and in several contracts with the European Space Agency and the local industry. He is IEEE Senior member and elected member of the IEEE Sensor Array and Multi-channel Signal Processing technical committee (2013-present). He has been associate editor of the IEEE Transactions on Signal Processing (2008-11, 2015-present), technical chair of the European Signal Processing Conference EUSIPCO 2011 and general co-chair of the European Wireless Conference 2014. Eleftherios Kofidis received the Diploma and Ph.D. degrees in 1990 and 1996, respectively, both from the Department of Computer Engineering and Informatics, University of Patras, Patras, Greece. From 1996 to 1998 he served in the Hellenic Army. In the period 1998 to 2000, he was a postdoctoral fellow at the Institut National des Télécommunications (INT), Évry, France (now Télécom SudParis). From 2001 to 2004, he was a research associate at the University of Athens, and adjunct professor at the Universities of Peloponnese and Piraeus, Greece. In 2004, he joined the Dept. of Statistics and Insurance Science, University of Piraeus, Greece, where he is now Assistant Professor. He is also affiliated with the Computer Technology Institute & Press “Diophantus" (CTI), Greece. His research interests are in signal processing for communications (with emphasis on multicarrier systems) and medical imaging. Dr. Kofidis has served as technical program co-chair in two international conferences (CIP-2008 and DSP-2009) and as a technical program committee member and reviewer in a number of conferences and journals. He has served as Associate Editor in the EURASIP Journal on Advances in Signal Processing (JASP) and the IET Signal Processing journal. He (co-)organized three special sessions on filter bank-based multicarrier systems (ISWCS-2012, EW-2014, and SPAWC-2015) and was lead guest editor for a JASP special issue on this subject. He has actively participated in a number of national and European projects, including the EU FP7 ICT projects PHYDYAS and EMPhAtiC. Dr. Kofidis is currently serving as Associate Editor in the IEEE Transactions on Signal Processing journal. Faouzi Bader received Engineering and Laurea degrees in Electrical Engineering (Communications speciality) from Université Mentouri Constantine (UMC) in Constantine, Algeria in 1996. He received the PhD degree in Telecommunications in November 2002 at the Higher Technical School of Telecommunications Engineering (ETSIT) of Universidad Politécnica de Madrid (UPM), in Madrid-Spain. He joined in 2002, the Centre Technologic de Telecomunicacions de Catalunya (CTTC) research center located in Barcelona-Spain as Research Associate. From 2006 to May 2013 he worked as Senior Research Associate at Access Technologies (AT) research area at the CTTC. Since June 2013, he is as Associate Research Profesor at the Signal, Communication & Embedded Electronics (SCEE) research group at SUPELEC University in campus of Rennes (Brittany), France. His research activities mainly focus on IMT-Advanced systems, cross layer system design, Advanced multicarrier waveforms (advanced OFDM(A), (non-) uniform multimode filter based multicarrier (FB-MC) schemes) and frequency allocation in relay cognitive environment, Future PMR/PPDR broadband systems, and 5G. He has been involved in several European projects from the 5th-7th EC research framework, dealing with resource management in multicarrier transmission techniques for integrated broadband in cellular systems, and physical layer for dynamic spectrum access and cognitive radio. He has published over 90 papers in peer-reviewed journals and international conferences, and more than 13 book chapters.